By reading this koob, you will discover the most important facts about the life of Elon Musk. -SpaceX successfully sent a cargo capsule to the International Space Station and brought it back to Earth. Who is scaring the hell out of the auto industry? Elon Musk, with his electric car company, Tesla. Who is Arianespace and the Russian Spatial industry’s worst nightmare? Yet again, Elon Musk, thanks to his company SpaceX. And that’s not all; the American businessman also created PayPal, an alternative payment system that simplifies payments across the world. So yes, Elon Musk is the man of the moment, a visionary who certainly won’t go unnoticed. 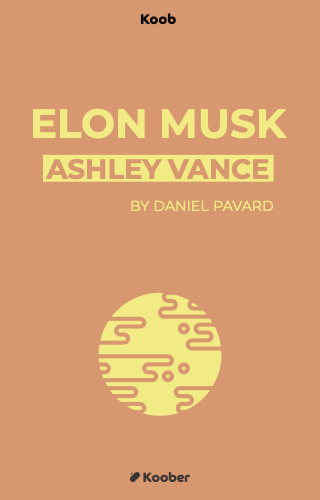 Ashlee Vance’s work is the result of hundreds of hours of interviews with Elon’s loved ones, family, friends, and business contacts; a significant, but necessary, amount of time when you want to learn about the most revolutionary entrepreneur on the planet.